Your business is all about making sure that your events turn out as planned and run smoothly and you know how to get that done. Usually it has much to do with having a Rolodex full of trusted names of contacts and vendors. We hope that you will soon be adding Cool Daddy’s division of Slushie Spot to your list. 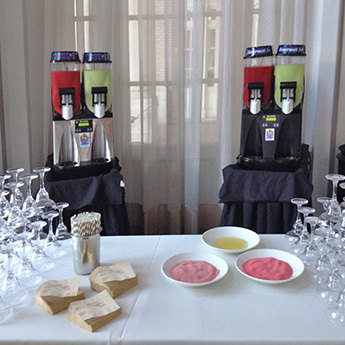 Providing Frozen Drinks is an easy, affordable and fun way to add flavor to ANY event. Over 15 years of experience and 1000’s of events have given us the experience that you can count on when your reputation is on the line. For large events there is nobody better at providing high capacity frozen drink machines and flavorful drink mixes that guests will love. Smaller events are always treated with the same customer care and personal involvement as the huge ones. Custom solutions can include branded experiences and customized drink choices. Our menu includes over 100 flavors of speciality drinks along with daiquiris, margaritas, mojitos and frozen martinis. We want to make you and your event look great, so please give us a call and lets discuss how we might work together at 770-861-7298 or toll free at 800-806-8959. 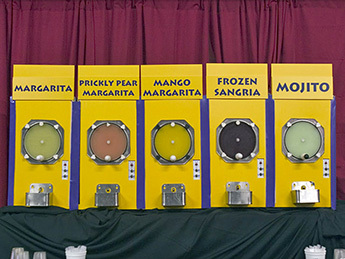 As Atlanta’s largest frozen drink machine rental company we guarantee to provide your party or special event with a high quality machine, the best products and exceptional service.